Are you looking for a sealer that will protect your pavement or driveway from the elements? 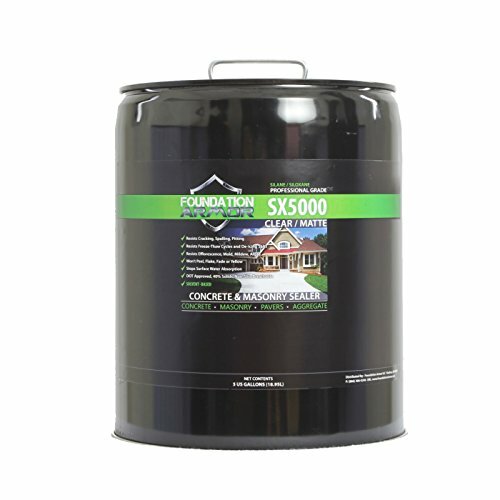 Foundation Armor SX5000 is a proven, durable, DOT approved, natural, and easy to apply sealer. It comes in 5 gallons container and can cover a wider area. Read this Foundation Armor SX5000 reviews to know more about this driveway sealer. Armor SX5000 WB sealer does a wonderful job of sealing pores and repelling water and other stains like oil. It will provide protection from elements and can last up to 10 years. The sealer as well maintains the natural look of your natural stone or aggregate. You can apply it in the interior or exterior and vertically or horizontally. Read on to discover this water-based sealer’s benefits, pros, and cons. First and foremost, this is an excellent sealer as it can be applied either inside or outside. So, regardless of where the surface is located, you will still be able to protect it using the same product instead of buying another one. It can also be applied horizontally or vertically. After sealing your surface using the Armor SX5000 WB, it will repel water and other stains. This water-based sealer penetrates deep into the surface where it chemically reacts to create water repellent barriers within the pores, which reduces water absorption by up to 95%. In return, it will resist damage caused by water absorption like spalling, cracking, salt damage, pitting, freeze-thaw damage, efflorescence, and mold & mildew. This is one of the reasons it approved by the Department of Transportation (DOT) as being a water repellent sealer. Using this sealer doesn’t require one to be a professional as it is easy and fast. Simply get a brush, roller, or pump sprayer. A brush is suitable to use when you have a small surface to cover, while a pump sprayer is ideal for covering a larger area. A challenge that many homeowners face is acquiring a sealer that doesn’t last for long. Most silane sealers last up to 5 years. But this is not the case with Armor SX5000 as it can last up to 10 years. As a result, you can rest assured that your pavement or driveway is protected away from the elements for at least the next 8 years or so. The 5 gallons Foundation Armor SX5000 WB sealer can cover up to 1000 square feet in just 1 coat and up to 500 square feet in two coats. This is amazing as most sealers are not able to cover such a wide area. If you’re covering a small area, you can always keep the remaining sealer for future use. Unlike other sealers that only limit you to certain surfaces, Armor SX5000 doesn’t. You can use this sealer on a variety of surfaces such as brick, concrete, natural stones, pavers, and aggregate. The Armor Sx5000 WB doesn’t change the look of your concrete driveway or paver. Instead, it maintains a natural and unsealed appearance. Unlike similar products, you will not see any visible surface film after applying it. On top of that, it has up to 5X more active ingredients than similar competitor products. It reduces dusting caused by surface abrasion and movement of moisture through the concrete pores. Armor SX5000 drastically reduces deterioration brought about by water absorption like spalling, staining, cracking, freeze-thaw, salt damage, pitting, efflorescence, mold, and mildew. Foundation Armor Sx5000 sealer does not beautify your surface as it only maintains its natural look. With the Armor SX5000 WB sealer, you will never go wrong when it comes to protecting your paver or brick from water and other harsh elements. It is easy-to-use and will offer you many years of protection. Question: Do I have to stir the Sx5000 sealer before using it? Answer: Yes, you should. It is not a must to stir this sealant before using as some clients say the used it directly without stirring. At times, good stuff may sit at the bottom of the can and stirring or shaking it will ensure that the sealer is properly mixed and not lacking anything. Question: Is the Foundation Armor Sx5000 capable of protecting my driveway from oil and transmission stains? Answer: Yes, it is. This sealer has silane/siloxane, which is outstanding when it comes to penetrating and sealing of a surface. Rainwater, oil, and other stains will not penetrate into the surface but instead, bead or pond on it. Still, have a question after reading this Foundation Armor SX5000 reviews? Comment below. Can I apply Foundation Armor AR350 over the SX5000? If so, should I use solvent based SX5000 or water base 5000WB?